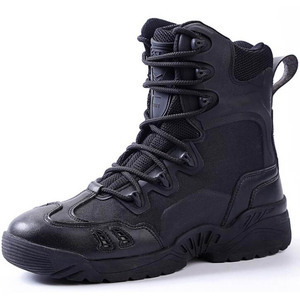 General speaking,more customers buying neoprene boots will choose polybag packing. 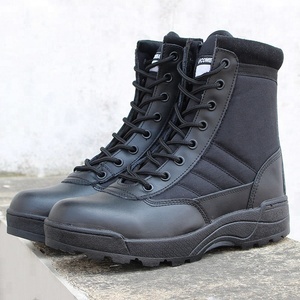 Detail pictures: Factory pictures: Advantages: 1.The neoprene boots are made of rubber. 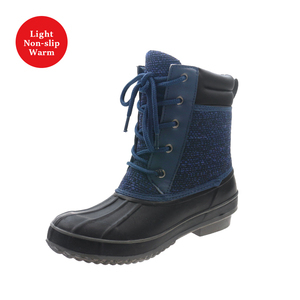 We have a design and technique team so that our neoprene boots are very competitive not only in quality but also in design. 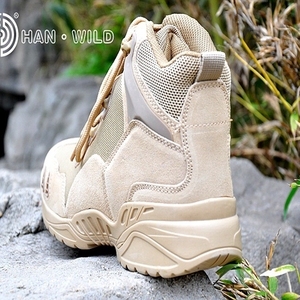 3 YRS Yiwu True Adventure Outdoor Co., Ltd.
6 YRS Wuhan Chuangshijia Trading Co., Ltd.
military men suede leather hunting hiking fashion boots Product military men suede leather hunting hiking fashion boots Upper Suede Outsole Rubber Lining Nonwoven Insole EVA Size 39-45 Color KHAKI Feature lace-up closure, oil-resistant, anti-slip MOQ 1000 Pairs Payment Term T/T or L/C Delivery 30-60days after we recieve your deposit or L/C at sight WE CAN ARRANGE BY YOUR REQUEST! SIZE OF THE SHOES U nit: cm More details: Different kinds of outsole: Sample room Dear client, our company and factories had localed in mid of China, we had more than 20 years experence for military items' making, and all the clients had satisfied with us whom worked with us before, we are pleased to invite you to come to our factory and discuss any business with us. 4 YRS Yiwu Feitu Outdoor Gear Co., Ltd.
3 YRS Guangzhou 318 Outdoor Gears Co., Ltd.
2 YRS Zecoola Shoes Dongguan Co., Ltd.
6. We aim to offer fast delivery , professional sales service and after. - Great network of supplier chain in footwear industry. 16 Years Experiences in shoes trading and manufacture. (2). 5 YRS Huaian Qiyue Shoes Co., Ltd.
5. Top quality owing to professional assembly division and quality control. Welcome to visit our factory before establishing long-term business cooperation. 3. Top quality owing to professional assembly division and quality control. 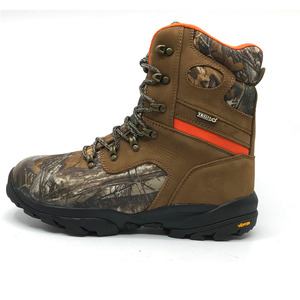 Product Name: Camouflage Waterproof Men's Hunting Boots, army boots Origin: China Materials: Polyester&Leather&PU&Rubber &As required Outsole: PU&Rubber&As required Size : (1) EUR: 40 US: 7 (2) EUR: 41 US: 8 (3) EUR: 42 US: 9 (4) EUR: 43 US: 10 (5) EUR: 44 US: 11 (6) EUR: 45 US: 12 Weight : Based on the Material Design: As picture shows & Customized Color: Black&Customized Feature: Anti-oil, anti-fuel, abraison resistant, breathe freely, soft and MOQ: 500 pcs Sample: Available OEM: Available Advantages: Injection construction, mature craft and good quality. Use: (1) Outdoor (2) Mountaineering (3) Hiking (4) Military Payment: (1) We accept payment terms: T/T,Western Union, L/C (2) 30% deposit before the mass production and 70% balance before the shipping. D etail: Model: GKTB-016 Color: Black , Sand, As your request Material : Waterproof leather (cowhide) Size:39-46 Best quality, best price, best service Specifications: Waterproof leather (cowhide) Carbon rubber sole (oil resistant / slip / low noise) Four special elastic insoles to absorb / reduce impact Strengthen the use of tactical climbing rubber toe The heel part of the additional friction-resistant rubber Strengthen the side friction shoes A rope at the dorsum of the foot control Three-tiered enhanced sewing The overall use of non-magnetic materials. 3. Question: What is your payment term9 -- By T/T or L/C at sight. 4. Question: What is your delivery time9 -- Normally in 60 days after prepayment is received. 5. Question: what is the quality guarantee time9 -- Six months quality guarantee is offered after shipping date. 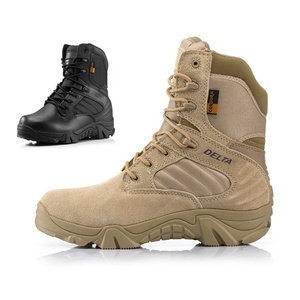 1 YRS Hangzhou Qiaolun Trading Co., Ltd.
Alibaba.com offers 4,359 hunting boots men products. About 42% of these are men's boots, 16% are rain boots, and 15% are other police & military supplies. 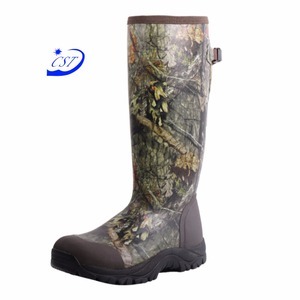 A wide variety of hunting boots men options are available to you, such as paid samples, free samples. 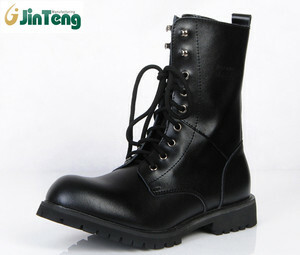 There are 4,359 hunting boots men suppliers, mainly located in Asia. The top supplying country is China (Mainland), which supply 100% of hunting boots men respectively. 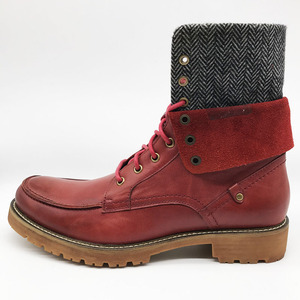 Hunting boots men products are most popular in Northern Europe, Western Europe, and Mid East. You can ensure product safety by selecting from certified suppliers, including 142 with ISO9001, 106 with Other, and 88 with BSCI certification.